Recipes & Herb Blends in Just Minutes!.. What to Expect From "Spice Magic"
Blends From China, India, US, Africa and Europe and Everywhere Else! How to Make Seasoning Salt and Lemon Pepper. And Many More! The "Spice Magic" recipe book is the go-to book in my kitchen. Jason has hit the nail on the head about how toasting and blending your own mixes and seasonings makes all the difference! A dear friend introduced me to her Indian mixes a few years ago, and I couldn’t believe how much more fragrant and tasty the spices were than what I had been buying pre-made in a bottle. Now, thanks to Jason, I have an easy reference book on how to make my own blends. He’s also thrown in some tasty recipes to try. His Barbecue Sauce recipe is simply the best I’ve ever tasted and I will never use store-bought barbecue sauce again! " Add Fabulous Flavours to Your Home Cooking! Have you ever opened up a jar of commercial powder and been slapped in the face with intense fragrances, vibrant colours and powerful aromas of the ground ingredients within? But make your own herb blends and mix recipes and I promise this is exactly what you can expect! Who knows how long store-bought powders, blends and seasonings have been sitting on the store shelves slowly losing their flavours and aromas? When it comes to spices and herbs, freshness is the absolute key! And with the mix recipes in "Spice Magic"; I'll show you how to create fabulous tasting blends and mixes using whole ingredients, pre-ground powders and dried herbs that's guaranteed to take your home cooked meals to a whole new level! 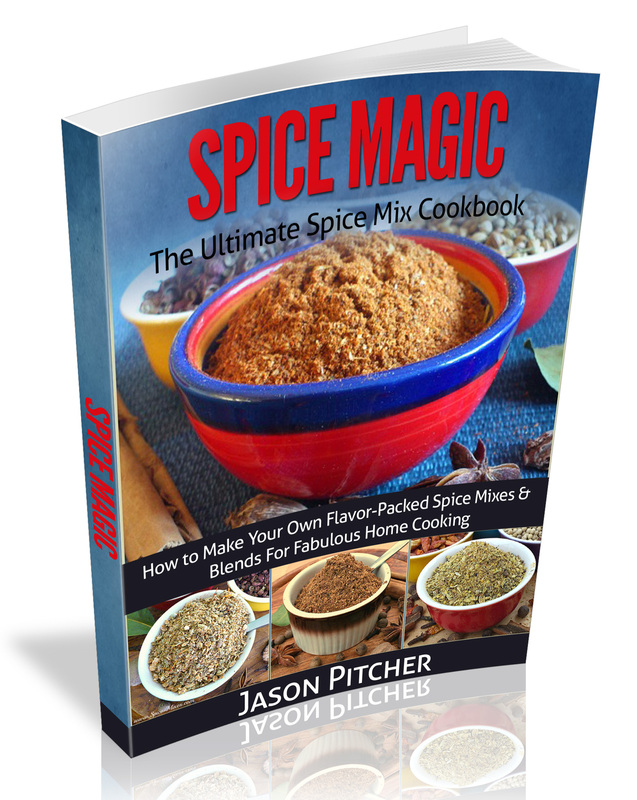 “I love the homemade seasonings and spice mixes in Jason's "Spice Magic" cookbook. As I grow a lot of herbs (and a few spices) for use in my home cooking already, I now have lots of ideas for interesting blends to try out". 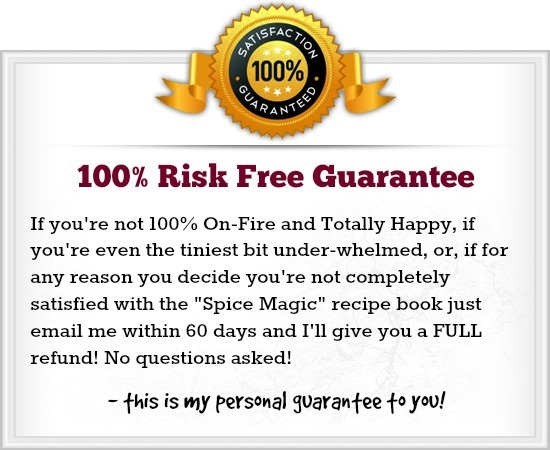 You can't lose when trying "Spice Magic" I am so confident with my product and the awesome recipes and dishes you will create, that I am giving you a 60 day money back guarantee, absolutely no questions asked! You get instant access and can start working on your recipes in just a few minutes from now. Remember you get a 60 day trial, so if any time in the next 60 days you decide this book isn’t for you, simply send me an email and I’ll refund every single cent you invested! Your order is processed with a safe and secure transaction and you will have access directly after our merchant approves your transaction. Download your copy of "Spice Magic" right now, and start your journey towards fabulous tasting food. This Digital book is delivered in PDF format which means that you can read it directly on your PC or MAC. Or, if you prefer, print it out and read it over your cup of coffee! P.S If you have any questions about this e-book you can contact me here.